The long-debated, often-revised plan for a proposed convenience store at the Shell station on Sunset at Via de la Paz may finally reach a resolution when the local Design Review Board meets in January. Owner Saeed Kohonoff hopes to demolish the existing service bay (1,900 sq.ft.) on his property and build a 2,748-sq.-ft mini-mart against the adjacent two-story building that features Il Ritrovo restaurant. But his plans have spent 18 months within the Pacific Palisades DRB process. New Shell owner Saeed Kohanoff wants to build a convenience store, which would be located in the rear of the lot. The new area would be landscaped and the service bays would be gone. Initially, in June 2015, architect Richard Finkel of Bundy Finkel Architects (a firm that has designed 18 auto service stations in California and Nevada) proposed a Mediterranean-style convenience store. The seven-member DRB asked him to bring in a mid-century modern design. He complied, and presented new plans in July 2015. At that meeting, it was suggested that Finkel had not captured the look and to “try again.” He was also asked to bring a landscaper to the next meeting and to focus on low-water plants and trees. The Shell station plans didn’t return to the DRB agenda until November 9, 2016. 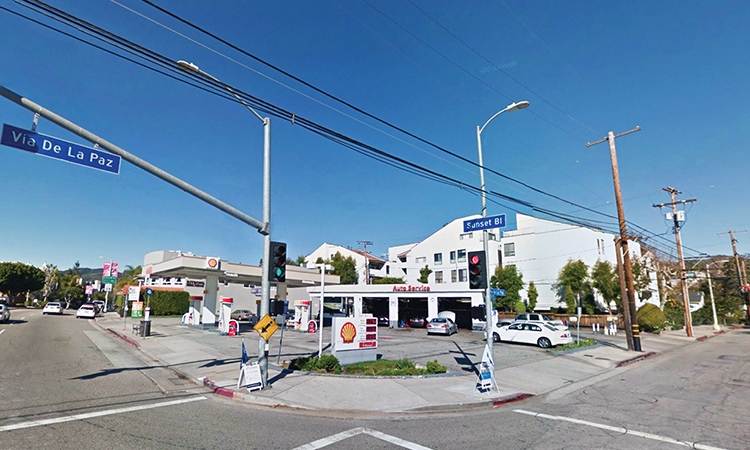 By then, Kohanoff ’s former Mobil station (which he sold to Caruso Affiliated), had been leveled to help make way for Caruso’s Palisades Village. At the November meeting, which was intended to be the final review of the Shell design, the board was still not happy with the rendering. DRB vice-chair David Hibbert told Finkel to look at some of Caruso’s proposed architecture, noting that because of that project’s size, its architectural style will become dominant in the Palisades business district, and any new buildings should reflect that new standard. During that meeting, the audience was reminded by L.A. City Planner Kenton Trinh that this meeting was not the place to discuss for the sale of alcohol permits (which Kohanoff is seeking) permits, hours of operation and traffic. His associate, Griselda Gonzales, reminded residents the hearing was solely about design and signage. Finkel gamely returned on Dec. 7 with yet another rendering for the convenience store, which will replace the existing building on the property. About 20 people squeezed into the Chamber of Commerce office for another three-hour meeting that, despite an admonition by Trinh, went beyond design issues to rehash concerns of nearby residents about the size of the store, hours, traffic, safety and alcohol sales. At the end of the meeting, the DRB asked for another architectural refinement and a fifth meeting was tentatively scheduled for January. Trinh was asked how the scope had changed. In the application, Kohanoff had said he would not seek to keep his mini-mart open 24 hours. He also had reduced the hours he sought to sell alcohol. He said that had been changed because of a meeting hosted by Councilman Mike Bonin’s office with the neighbors. But those neighbors at the Dec. 7 meeting said they had not agreed to anything. Before he sold his Mobil station property to Caruso, Kohanoff met in 2014 with Chris Spitz and Barbara Kohn, who at the time were Pacific Palisades Community Council president and vice president, and also with Rick Mills, who was chair of the DRB. Kohanoff told the News on Dec. 7 that over coffee at the Highlands Starbucks, he had asked them how a sale and a subsequent move of his convenience store to the Shell site might be received by the town. “They told me it was a good idea,” he said. The News contacted Spitz, Kohn and Mills.